All solid Black areas should be composed as a combination of C 60%, M 50%, Y 50%, and K 100%. 220 mm wide by 290 mm vertical. 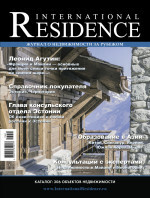 International Residence is printed only in the Russian language. We would be pleased to make professional translations of your pages, if required.